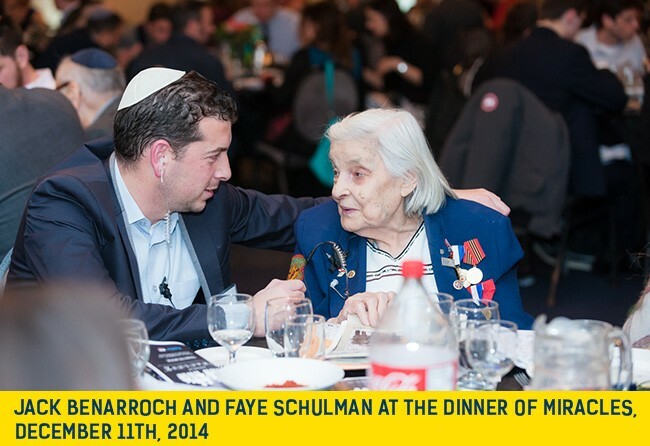 By Shayla Schipper - United by a shared history, Holocaust survivors and young professionals came together for the 10th anniversary of the Dinner of Miracles. The Petah Tikva Anshe Castilla Congregation played host to over 45 survivors in their eighties and nineties and 250 young professionals under age 40 for an evening of fascinating dialogue over a four-course meal. The annual event presents Holocaust education in an interactive and informal setting, serving as a platform for discussion between the generations, where survivors provide first hand testimonies of the horrors experienced under the Nazi regime. As opportunities to directly interact with Holocaust survivors become unfortunately fewer with each passing year, the evening has become increasingly important. The event is appropriately timed before Hannukah, a holiday that recognizes the power of miracles, the unwavering strength of the Jewish people, and the triumph of light over darkness. Like the eternal flame of the shamash, each survivor passed on their stories of bravery, loss, and hope to the receptive audience, and in the process, illuminated younger participants with every detail of their experiences. With each harrowing recollection, young professionals are given access to memories from a time when the speaker was not much younger than they are now. Despite the serious nature of the discussion between the two generations, the event is not shrouded in sorrow, but rather displays the power of passing on a legacy and commemorating a shared heritage. Education and legacy are the two main themes of the event and were captured in the keynote address by Dr. Bernd Wollschaleger, author of A German Life: Against All Odds Change is Possible. Dr. Wollschlaeger described his struggle of growing up in Germany in the shadow of his father, a highly-decorated WWII tank commander and Nazi officer who received the Knight’s Cross from Adolf Hitler himself. He explained that in school, the murder of six million Jews was painted as “collateral damage of the war”, rather than as an act of systematic extermination. Dr. Wollschaelger had no knowledge of his own father’s involvement in the Holocaust until a pivotal discussion revealed that he in fact had directly participated in an operation that killed about 200 civilians. Through his quest for answers about a hidden past, Dr. Wollschaleger forged ties with the small Jewish community of Bamburg, Germany and gleaned insight of their traditions and culture. He eventually converted to Judaism, emigrated to Israel and served in the Israel Defense Forces as a Medical Officer. Through the sharing of personal testimonies, receptive young professionals left the evening with a greater understanding of the Holocaust and a desire to carry on the legacy of the beloved, brave and respected survivors. UJA Federation’s Community Connect builds community with and for young adults in their twenties and thirties. Community Connect has partnered with the DOM for a number of years, helping to ensure as many young professionals as possible have the opportunity to interact with and learn from Holocaust survivors. Another opportunity for Holocaust education is the Young Adult March of the Living (MOL), which was featured at the Dinner of Miracles as well. The MOL is a trip to Poland and Israel for young adults aged 21-35 to learn about the Jewish community that once flourished in Europe, the tragedy of the Holocaust, and the establishment and survival of the State of Israel. These next few years will be the last in which survivors are able and willing to travel with the groups, and as such the DOM took a moment to encourage young professionals to take part in the powerful educational opportunity of the March of the Living. Since its inception 10 years ago, the Dinner of Miracles has brought together over 2,000 young adults with hundreds of Holocaust survivors. This program has done a remarkable job educating young adults about the Holocaust, while honouring the miracle of survival, the tenacity of hope, and the resilience of the Jewish people.